As seen from Bryant Park, this storm drain empties into the Calapooia River on April 1, 2018. In Linn County Circuit Court, lawyers for Albany filed a petition for judicial review on Jan. 28. As defendants the action names the Oregon Department of Environmental Quality, the Oregon Environmental Quality Commission, and DEQ Director Richard Whitman. A hearing on a preliminary injunction requested by the city has been twice postponed and now is scheduled before Circuit Judge Thomas A. Hill at 11 a.m. Feb. 19. The DEQ filed the regulation on stormwater discharges on Nov. 30, 2018. 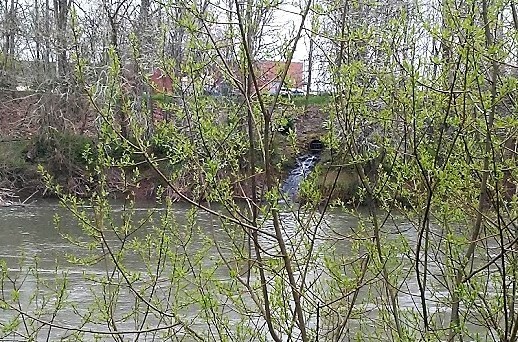 It’s called a “Phase II MS4 Permit” and tells Albany and 19 other cities and six counties what they must do to keep pollution in rainwater runoff from reaching streams. Albany and other affected cities have been working with the DEQ for years, but the agency ignored their objections that the requirements were impossible or too expensive to meet. Albany’s petition for review was filed by Casey M. Nokes and Laura Maffei, lawyers with the Portland firm Cable Huston LLP. The city makes numerous points, all boiling down to its argument that the state regulation goes well beyond what’s required by the federal Clean Air Act, and that therefore it violates the state constitution’s ban against unfunded mandates. For instance, the permit says that if it’s determined a discharge violates a water quality standard, the city has 48 hours to start an investigation, and 60 days to report to DEQ the corrective action taken or planned, and then must carry out the action as approved by the DEQ. Protecting the rivers from bacteria, the city’s petition says, would require almost constant investigation and reporting to the DEQ of illegal camps and wildlife and pet droppings. “This is technically infeasible, impracticable, and a violation of the Clean Water Act,” the suit says. (Feb. 19) By mutual consent of the parties, the court has stayed the enforcement of the MS4 permit until further notice. What happens next is unclear, but presumably the stay will give the DEQ and affected jurisdictions a chance to work out a more feasible and less costly set of storm water regulations. Hasso, thank you for this update. The City argues, like Mayor Konopa re:the homeless, that having and preserving clean water is essentially just a lifestyle choice. Additionally, the City /CARA didn’t even blink when they dropped well-over the asking price on an abandoned bank building downtown. But, they’re blinking over clean water. Sounds like Flint, Michigan all over again. Seems to this reader that having and maintaining clean water is at least as important as rebranding downtown Albany into an attractive lifestyle choice for the well-off. And, here we go again, with Albany dollars being paid out to Portland attorneys. What…are the lawyers in this area not smart enough to fill out the forms? How can the homeless waste even compare to the thousands of gallons of raw city sewage that accidentally flows into the river every time the rain get a little crazy? Or am I just not getting it?